In cold areas, often in mountains, under rocks and in litter in forests, and in caves. In summer the North American species feed at night on insects frozen on the surface of snow fields; they are somewhat omnivorous. Western North America, Japan, Korea, China, Siberia. Unknown as fossils, although some researchers (e.g., Vrsansky et al. 2001) consider grylloblattids to be related to the Protorthoptera complex dating back to the Carboniferous. Ando, H., ed. 1982. Biology of the Notoptera. Kashiyo-Insatsu Co., Ltd., Nagano, Japan. 194 pp. Béthoux, O., A. Nel, J. Lapeyrie and G. Gand. 2005. New data on paleozoic Grylloblattid insects (Neoptera). J. Paleontol. 79:125–138. Gurney, A. B. 1948. The taxonomy and distribution of the Grylloblattidae. Proceedings of the Entomological Society of Washington 50:86-102. Gurney, A. B. 1961. Further advances in the taxonomy and distribution of Grylloblattidae. Proceedings of the Biological Society of Washington 74:67-76. Jarvis, K. J. and M. F. Whiting. 2006. 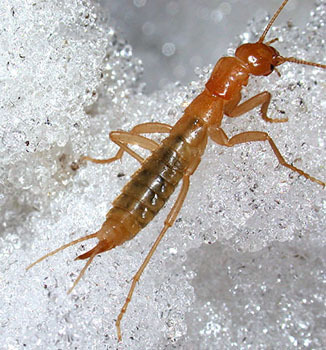 Phylogeny and biogeography of ice crawlers (Insecta: Grylloblattodea) based on six molecular loci: Designating conservation status for Grylloblattodea species. Molecular Phylogenetics and Evolution 41(1):222-237. Kamp, J. W. 1973. Numerical classification of the orthopteroids, with special reference to the Grylloblattodea. Canadian Entomologist 105:1235-1249. Storozhenko, S. Y. 1988. A review of the family Grylloplattidae [sic] (Insecta). Articulata 3(5):167-181. Storozhenko, S. Y. and J. K. Park. 2002. A new genus of the ice crawlers (Grylloblattida: Grylloblattidae) from Korea. Far Eastern Entomologist 114 :18-20. Vrsansky, P., S. Y. Storozhenko, C. C. Labandeira, and P. Ihringova. 2001. Galloisiana olgae sp. nov. (Grylloblattodea: Grylloblattidae) and the paleobiology of a relict order of insects. Annals of the Entomological Society of America 94(2):179-184. Walker, E. M. 1914. A new species of Orthoptera forming a new genus and family. Canadian Entomologist 46:93-99. Walker, E. M. 1937. Grylloblatta, a living fossil. Transactions of the Royal Society of Canada 31:1-10.